A woman and a child both escaped from a car which suffered a tyre blow-out and hit a wall before crashing into a lorry on the A27, police said. Emergency services are still dealing with the three-vehicle crash. Update: The A27 had been closed between Tangmere and Fontwell roundabouts, but thew westbound carriageway is now open along with one lane of the eastbound carriageway, as a large oil spill is dealt with. It happened around 2.35pm (Wednesday, December 6) in the eastbound carriageway and the female car driver has suffered a head injury, police said. A Sussex Police spokesman said: “A silver Peugeot 206 hatchback is thought to have suffered a blown tyre while overtaking a Scania articulated lorry before colliding with a wall, hitting the lorry and overturning. 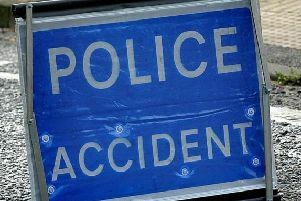 “A blue Ford Transit van also sustained minor damage. “The Peugeot driver, a woman in her 20s, and a child both escaped from the car, but the woman was reported to have sustained a head injury.